Russian Prime Minister Dmitry Medvedev appointed current deputy Economic Development Minister Evgeniy Elin as an acting Economic Development Minister after Ulyukayev was charged with bribery, Medvedev's press attache Natalya Timakova said Tuesday. 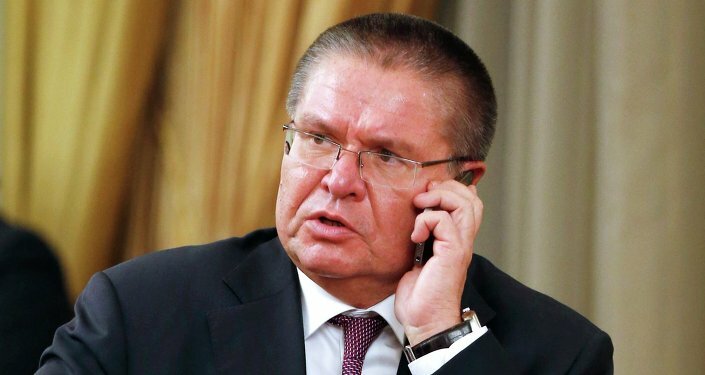 MOSCOW (Sputnik) — Ulyukayev has been charged with taking an especially large bribe and extortion, Investigative Committee spokeswoman Svetlana Petrenko said earlier Tuesday. "Medvedev signed a decree imposing temporary duties of minister of economic development on Deputy Minister of Economic Development Evgeny Ivanovich Elin," press attache Natalya Timakova said. Earlier, Kremlin spokesman Dmitry Peskov stated that Russian President Vladimir Putin has not yet decided to dismiss Economic Development Minister Alexei Ulyukayev. "I do not know if President Putin decided on the dismissal either independently or on the proposal of the prime minister. I do not know about this yet," Peskov told reporters. The spokesman added that the preliminary investigative activities required much time. "I cannot specify it. Certainly, it required a certain considerable amount of time," Peskov said when asked when President Vladimir Putin had been informed about operative activities regarding Ulyukayev. Russian President Vladimir Putin and Prime Minister Dmitry Medvedev exchanged information on preliminary investigative activities regarding Economic Development Minister Alexei Ulyukayev, presidential spokesman added. "They certainly exchanged information," Peskov told reporters when asked whether Putin told Medvedev about the preliminary investigation. The Kremlin sees no link between a possible government resignation and personal accusations of bribery leveled against detained Economic Development Minister Alexei Ulyukayev, Dmitry Peskov also said. "I do not see the connection, because we are talking about personal accusations, which in and of themselves do not constitute the recognition of a person, a minister as guilty, corrupt." Peskov likened the possibility of a mass resignation to "collective responsibility." Russia's Investigative Committee said early on Tuesday that Ulyukayev was caught in the act when taking a $2 million bribe for a positive appraisal that allowed Russian energy company Rosneft to buy the state's shares of Bashneft oil company. Petrenko stressed that the Bashneft deal is legal and undisputed, noting that the agreement is not under investigation.